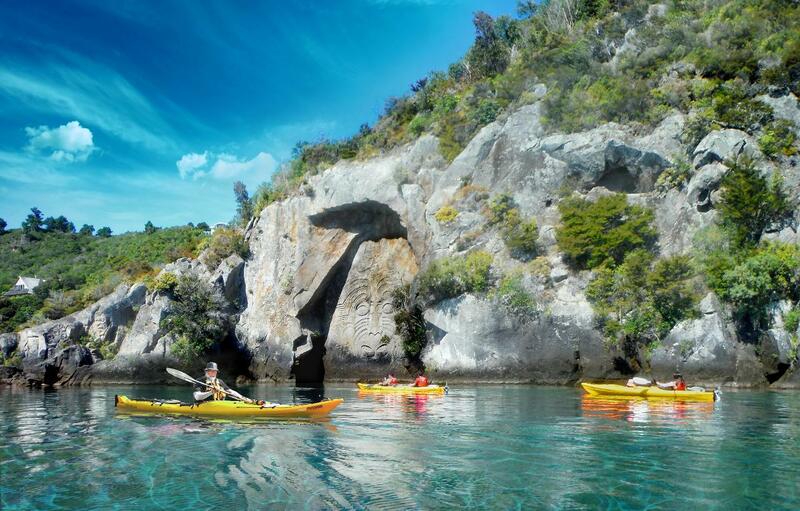 Summer Special - Get 10% off our Kayak to the Maori Rock Carvings tour if you book with 3 people or more making it only $100pp. Normally $110pp. Specials end 31 December 2018. Beginning in the sheltered waters of Acacia Bay, come out with us and explore the secluded Rock Carvings at Mine Bay. Paddle below native bush, past steep cliffs and mini inlets that can only harbour a kayak before the amazing 100 metre-high carvings come into view. Your experienced guide will explain the carving's cultural significance to the lake and surrounding areas while you float beneath them. On our return we stop for gourmet refreshments, where you can take the opportunity to swim in the clear waters of our beautiful lake. If the breeze comes up, we can raft our kayaks together and sail back – bliss! No experience is necessary, as all our trips are guided and full instruction is given. Our double kayaks are safe and easy for everyone to use. 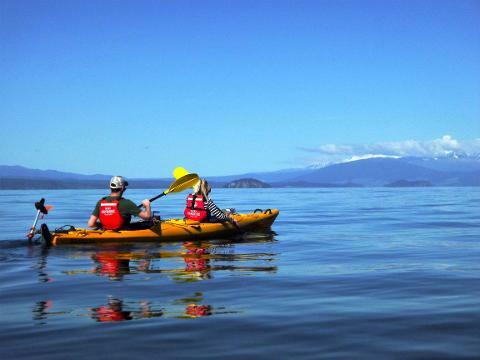 Children under the age of 12, must be accompanied by an adult in our kayaks. This is truly a unique trip and one you will remember for ever. On request only (if you do not have your own transport) - Pick up from/to Taupo CBD. Please call or email to arrange.